During my work with cataloguing the important guitar music collection of the late Daniel Fryklund, now housed in the Statens musikbibliotek (The Music Library of Sweden), Stockholm, Sweden, I found a French song, composed by Fernando Sor, which seems to be unknown and perhaps unique. The song is hidden in one (volume 23) of the many bound volumes of French songs with guitar accompaniment in the Fryklund collection of which none is catalogued in the library. The title of the song is "Mon dernier mot / Romance / Paroles de Mr. P.A. Vieillard / Mise en Musique et Dediée / á / Mr. A. Panseron / par / Ferdinand Sor / Prix Fs. / Paris, Chez Savaresse Sarra, Éditeur et Md. de Musique, Palais Royal, No. 36" and it was published c. 1828-35, most probably around 1829-30. The text to the song is written by the French "littérateur" Pierre-Ange Vielliard de Boismartin. Born in Rouen in 1778, but active in Paris, Vielliard was a prolific writer and had in his time a considerable reputation as a dramatist. He was employed at the "Trésor", later royal censor, curator at the "Bibliothèque de l'Arsenal" and finally librarian at the senate. He wrote texts to comedies, vaudevilles etc. performed in the first decades of the 19th century. As a poet he published several works as well as other romances for the guitar and the pianoforte, published in music periodicals such as Journal des Troubadours (for piano and harp), Le Souvenir des Menestrels, Le Troubadour ambulant and Journal de Guitare during the period 1810-1825. Music to his texts was provided by Antonio Pacini, Louis Balochi, Xavier Désargus and George Lambert. During the latter part of his life he wrote a biography about Étienne Nicolas Méhul: "Souvenirs de théatre, Méhul, sa vie et ses oeuvres" (Paris 1855). Viellard passed away in 1862. The song is dedicated to Auguste Mathieu Panseron (1796-1859), the French song teacher and composer. 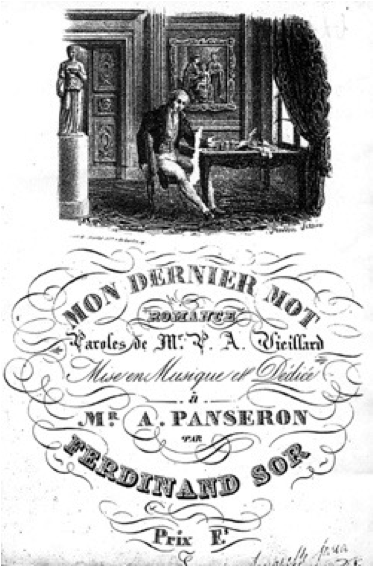 At the time when Sor probably composed "Mon dernier mot" Panseron was working as teacher at the conservatory in Paris (from 1826 professor "des solfège" and from 1831 in "vocalisation") and in 1829 he succeeded Jacques Fromentat Halevy as accompanist at the italian opera. Panseron was himself a prolific composer of songs and operas. Panseron and Sor must have been acquainted as they performed at the same concert in March 1830. Sor's song, with the music engraved and the title-page in lithograph, follows a long and rich tradition of publishing songs with guitar accompaniment, particularly in France, from the end of the 18th century until the mid 19th century. Thousands of these songs were published during this long period, in a similar size (27 X 18 cm), mostly engraved and from the 1830s and onwards often adorned with lithograph pictures, illustrating and enhancing the music. The lithographic picture furnished with Sor's song was made by Marlet et Companie, rue du Bouloi 19 after an original by Frederic Sorrieu. Many of these songs were published in periodical journals as Journal pour la Guitare, Journal de Lyre ou Guitare, Le Troubadour Ambulant, Le Troubadour des Salons etc. However, this is not the case with Sor's song, which seems to have been published separately. The Fryklund collection is particularly well furnished with such prints of which many today are exceedingly rare. Many of the guitarists of the 19th century were active in arranging the guitar accompaniments to these songs: Carulli, Carcassi, Meissonnier, Lemoine, Doisy, Marescot, Vimeux, Pacini, Borghesi, Lemoine, Porro, Lintant, Piston, Molino, Phillis, Chauvet, Desjardin, Gatayes, Volpato, Galland, Defrance, Grumaille, Sola, Cardon, Garnault, Poirier-Latalle etc. No detailed study of this vast repertoire of songs to guitar accompaniment has hitherto been made although such a study greatly would enlarge our knowledge on the history of the guitar in the first half of the 19th century. The publishers of Sor's song, Savaresse Sara, was since 1766 primarily occupied with the manufacture of musical strings. Shortly after 1826 they started a publishing company as well as a music shop under the name of Savaresse Sara (Philibert Savaresse and his wife Joséphine-Catherine Sara). They kept on until 1835 when the company was sold to Jean-Antoine Meissonnier. Savaresse Sara also published another song by Sor: "Loin de tes yeux Romance avec accompagnement de Piano Paroles de M.E. de Tarade" c. 1828-1835. The accompaniment for the guitar is completely in Sor's way of composing and follows the detailed instructions in his method for the guitar where he notes: "Si un air est composé pour être accompagné par la guitare, je suis le plus grand partisan de la simplicité dans l'accompagnement, parceque tout l'effet, en ce cas, doit dependre du chant, et que l'accompagnement n'a d'autre but que de marquer la mesure et d'indiquer l'harmonie exigée par la basse". The lowest string is tuned to D, another typical feature of Sor. There are however several misprints in the accompaniment for the guitar. The B in the third beat in bar 3 should be an A. The chord of the second beat in bar 13 should perhaps be a and d# instead of a# and d. The following chord should perhaps be e, g# and d instead of e, g and d. The first beat in bar 14 should be A instead of B. The C# in the third beat of bar 23 should be A. 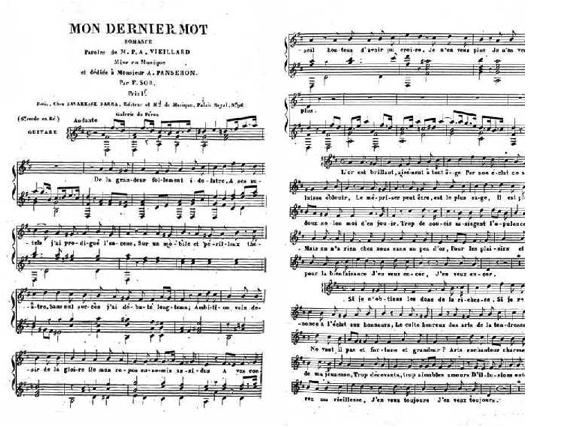 Finally the F in the final bar should be D. Sor's production of French songs is not large: only seven are known including "Mon dernier mot". Another of Sor's French songs, "O vous que Mars rend invicible", published by Antoine Meissonnier in 1827 is also to be found in the Fryklund-collection. As Jeffery points out, Sor's own opinion about this genre was low: "Je ne pouvais concevoir que cette musique pût être trouvée bonne". The original German version of this article was published in Gitarre & Laute, 26/1994, Heft 4 Juli/August pp. 39-43. An English version was published in Soundboard Vol. XXII, No. 1 pp. 39-43, an Italian version in il Fronimo No. 93 1995 pp. 37-4 and a Swedish version in Gitarr och Luta 27/1994 No. 4 pp. 23-25. The song has been published in a revised edition by Elena Marinangeli and Fabio Rossini: Ferdinando Sor Mon dernier mot romanza per voce e chitarra. E.4830 B Bérben Edizioni Musicali, Ancona Italy 2002. An article about this edition by Fabio Rossini appeared in Strumenti e Musica anno cinquantaquattresimo - n. 6 Giugno 2002 p. 15. The song is also published in Fernando Sor, Music for Voice and Guitar 38 Songs, published by Chanterelle-Verlag (ECH497).